January 2019 in Alabama has been an unpredictable one. It seems like just as we were starting to pack away the heavy coats and prepare for warmer weather, Jack Frost decides to nip and nash at our noses. January has experienced tornados, storms, ice, and heat waves–how on earth are we suppose to know what to expect on any given day?! Lucky for us, just as one aspect of our life goes cattywampus, the Lord gives us solitude in another part; for every little surprise, we can become more aware of the things in our life that are consistent. Some of the things in our lives that are dependable are God’s love, our families (whether biological or adopted), and the compassion within our community. It never ceases to amaze me how willing people are to extend a helping hand and make their resources available for the sake of their fellow man. 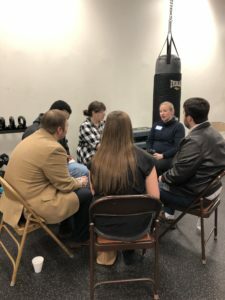 Timberline Inspections led Grace Klein Community’s first speed networking event, kicking off the New Year… and man, was it a success! Thanks to Erin Holtz, we shared a beautiful space at Pure Fitness to meet and greet dozens of local entrepreneurs and key business figures. 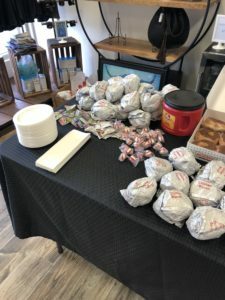 The event began early in the morning, and Chick-fil-a The Grove generously donated chicken biscuits! With full tummies and warm hands from the coffee, we were ready for the schmoozing to commence. Over twenty different business were represented at this event, including Ashley Ford, the creator of Military Saves App, Elizabeth Miller, the Executive Director of The Bluffs at Greystone, Justin Jenkins with the Law Office of Justin Jenkins, and Denise Wallace, the Business Development Director of WAY-FM. And, at the risk of sounding nepotistic, a very warm “thank-you” needs to be paid to the GKC volunteers who showed up to help set-up, break-down, and represent Grace Klein with poise and charm. Georgio, Bethany, Zonia, Tracie, and Kelly, along with Rachael, shared the mission and goals of our community resource with all the attendees. Hands down, GKC had the most representation at the networking event. Without the help of Rachael, Erin, and Cody, the Networking Event would not have been the same smooth, welcoming success. By the end of the event, everyone seemed relaxed and pleased with their new partnerships and connections. 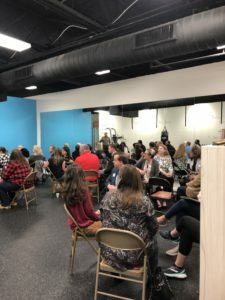 Rachael, Grace Klein Community’s Director of Marketing and Development, shared with me how she continues to hear great stories of how attendees have continued to foster the connections they formed during the meet-up. Our prayer is the resources shared among the organizations will allow the attending businesses to boom in 2019!